Mobile Wallets are run from your Mobile (Phone, Tablet,..) device. Great for storing and spending SmartCash. The SmartCard is a way to hold SMART on a physical card. You don’t need a phone to hold your SMART. If you have ever had a problem with using a phone inside a building…you will get why this is ideal. Only the merchant needs the internet connection. As simple to use as a credit or debit card but not controlled by any 3rd party processor. And not a preloaded card using a visa fiat system…this is real crypto to crypto. Accept SmartCash as a payment option in your business with zero fees using a simple SmartCash app. The SmartPay app is available for use anywhere in the world, all it requires is access to the internet. 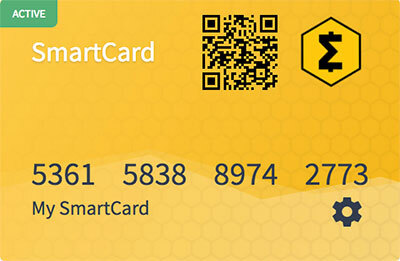 With SmartCash Card you can scan your cards or install them directly from your cards dashboard at http://card.smartcash.cc. Stash that SmartCash in your brain! generate addresses with a seed phrase! PLEASE ALWAYS DOWNLOAD THE PAPER/BRAIN WALLET AND OPEN IT WITH THE BROWSER OF YOUR CHOICE OFFLINE! Hardware wallets are Security Devices that protect your Wallet from hackers and thieves. Hardware Wallets work with the wallet software on your computer by taking over the management of private key generation, private key storage, and transaction signing. Great for long term storage. Disclaimer: Do not move your wallet.dat with your wallet running. Backup your wallet by using the backup wallet command from the QT wallet menu or by closing the wallet and waiting about a minute to close and copy the wallet.dat file. Always keep at least one copy of your wallet on an external drive. Do not shutdown your computer with wallet running or kill the wallet process. These can cause the wallet to get corrupted. Always exit the wallet from the menu or close x and wait for it to shutdown before turning off your computer.